But we all know there really is a Santa Claus, because that’s just an anglicized nickname for St. Nicholas, a wonderfully generous fourth-century bishop who lived in Asia Minor and whose feast happens to be Dec. 6, a perfect time to usher in the gift-giving of Christmastide. This true spirit of Christmas, which is giving, not receiving, is dramatically displayed at St. Matthew Church in Northeast Philadelphia on every St. Nicholas Feast Day. 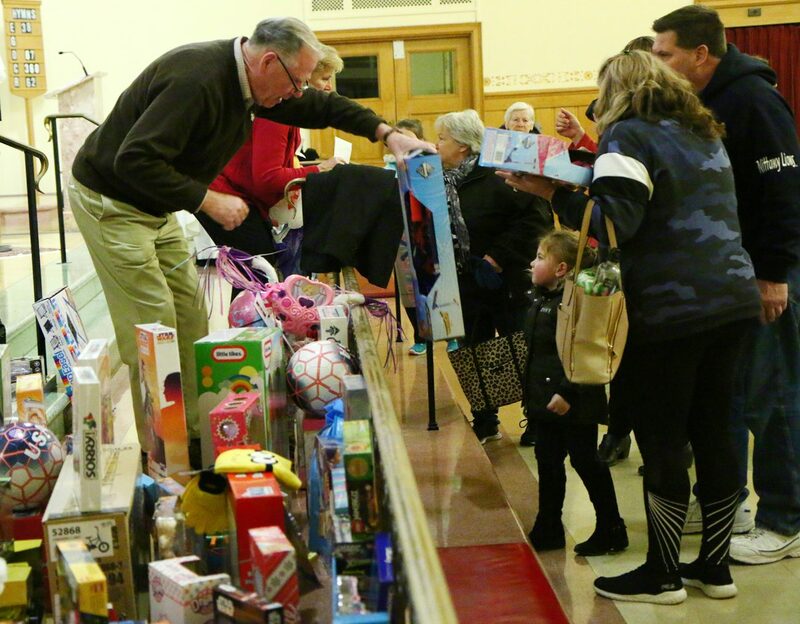 The children of the parish school, kindergarten through eighth grade, bring many hundreds of toys to the church, not to be exchanged but freely given to less fortunate children in their community and beyond. This year, a special event was the symbolic presence of the Blessed Mother and St. Joseph, as portrayed by Aubree Ross and Cooper Mawery, two of the tiniest students at St. Matthew School. “Two of the most remarkable people in history are Mary and Joseph,” said St. Matthew’s pastor, Father Patrick Welsh, in his brief homily. “Mary had to say yes to the angel to be the Mother God,” he explained. “Joseph had to say yes to the angel to be the foster father of Jesus, and in this way God prepared the world for the gift of Jesus. The annual celebration of the Feast of St. Nicholas through gift giving at St. Matthew goes back many years, according to organizer Pat Guerin, a 7th grade teacher and mother of six, who along with her husband, Paul, has worked at the event for the past 25 years or so. Although St. Matthew does indeed have a multitude of programs, “This is one of the nicest and most satisfying things we have all year,” agreed Immaculate Heart of Mary Sister John Magdalen, the principal of 620-student St. Matthew School. 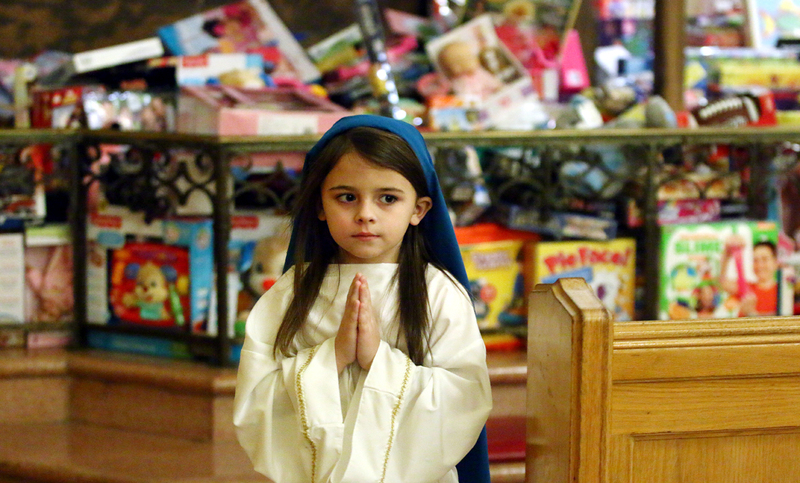 Clearly the greatest gift of the annual “toy Mass” is the lesson learned by the school students. At the other end of the school spectrum was Hope Mariner, who is in kindergarten. “I brought a teddy bear,” she said. As for what she wants for Christmas, “a doll,” she said. But perhaps her greatest gift is one she is subtly learning now. It is truly better to give than to receive.